More about "Ozone at lower latitudes is not recovering" | Watts Up With That? More about "Ozone at lower latitudes is not recovering"
My attention was captured by the same story posted earlier: “Ozone at lower latitudes is not recovering, despite Antarctic ozone hole healing“. Here’s the thing, even more interesting — Sometimes the science news cycle throws up interesting juxtapositions. That story appeared as one half of an interesting pair which both appeared in my email inbox today. Now we have something new to worry about — yet another human-caused threat to health and safety — maybe an ingredient in paint thinners is causing a dangerous thinning of the protective ozone layer where most of us live. “The sun might emit less radiation by mid-century, giving planet Earth a chance to warm a bit more slowly but not halt the trend of human-induced climate change. Well, that’s good news — the cool down of the Sun might save us from [cue scary music] Climate Change. Could the thinning of stratospheric ozone in the Tropics be related to the reduced energy from the sun? This is just a note about two interesting papers appearing simultaneously. I don’t really have any opinion on the matter and am not very knowledgeable about either subject — the Sun or the Ozone Layer — so won’t be able to answer very many [any?] of your questions. I’m interested in following the discussion in the comments. February 7, 2018 in Climate News. The Figure shows a TINY solar cycle 25. This is wishful thinking with no basis in reality. The current prediction of cycle 25 calls for a cycle a bit stronger than cycle 24 that is now ending. So no grand minimum this time. some evidence to support that assertion would make it more believable. You mean from the guys who made the Figure? We have recorded your opinion on SC25 and I have given links to two other opinions, and included the Summary Page on SC25 from your presentation further on. To a certain degree, none of that matters, because only in the last few months have we reached the point [stabel polar fields] where prediction can be considered to be good. That study has been thoroughly debunked, e.g. The study I posted only went back three cycles and forecasted thee cycles ahead. The “debunking” comment referred to a later study extending that to a longer period of time. Until the actual cycle happens, we really have two different approaches to forecasting. On an evidence based approach, I don’t know which will prove more accurate until the next cycle appears. The very first paper on that ‘method’ had it wrong too. A model that cannot represent the past cannot be trusted to predict the future. You are doing yourself a disfavor by clinging to ‘fake’ solar news. But so what, if it makes you happy. Models only have “common sense” ability to predict — what has happened before is like to happen again….if the underpinning ‘system’ is not known — if the real causes and effects are not known, proven and built into the model — then the ability of the model to correctly forecast the future is impaired to the degree of the unknowns. Except for strictly mathematical models, such as in Newtonian physics, our understanding of complex systems is rudimentary at best — thus our model predictions are vague and usually wrong. Isvalgaard you said ” The current prediction of cycle 25 calls for a cycle a bit stronger than cycle 24 that is now ending. So no grand minimum this time. ” This is pure BS do you not understand that the “current prediction” means nothing we won’t know what way cycle 25 is going until we are in it and it is near the end of cycle 25. I wish on God green earth so call educated people would understand a prediction of the future is worth nothing more that cost it to expel the words. At least in the investment community they have to disclose past performance is no guarantee of future results to bad climate scientist or for that matter and so called expert should have to disclose that. We have a likely mechanism for what causes the solar cycle [dynamo working of magnetic flux left over from a cycle]. It has succesfully predicted the last four cycles and postdicted many more. So there is a good chance our understanding will carry SC25 too. Mark Luhman ==> Dr. Svalgaard, whether you agree with him or not, is actually a highly respected scientist in the field of Solar dynamics .. not just some nerd off the streets nor some “angry ‘tween-aged troll”. His professional work IS solar prediction (among other things). If you’ve been reading comments here, you will know that he has expressed his opinion and his prediction about the future SC25 — more than several times here today. which leads to his very long, very involved, very technical PowerPoint presentation on the topic — which I suggest you read if you’d like details on why he holds the opinion he expresses here. Kip I don’t care there are highly regarded, he had three good guess so what? What does it mean, he need to state my best guess from what I have study it the cycle 25 will be going up not down. not that it is likely and more that a batter that had seven hit is going to get the eight. That life I don’t care what his paper said and how right he is, they have been people in the finical marker far more accurate for years that the fine Doctor and yet they have to put the discloser in it about time the climate scientist have to also. Since the activist take people like the good Doctor word and cause trillion of dollar to be wasted on worthless predictions. Mark ==> Did you read his presentation? Let me give you an example of the value of good predictions. 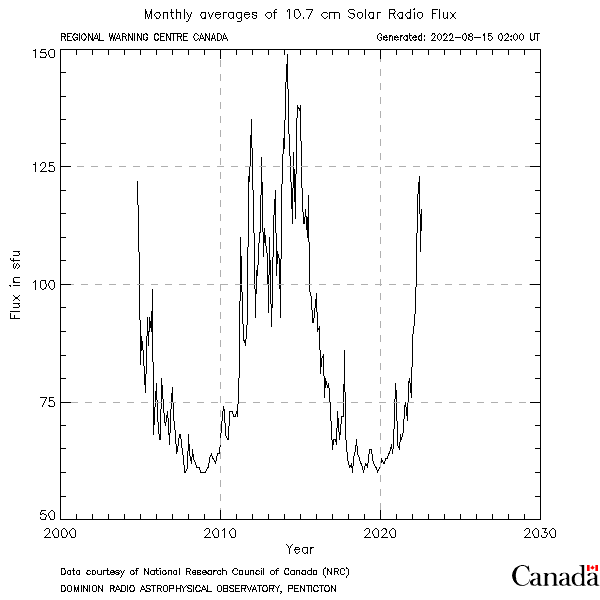 Back in 2005 or so, there were concerns about the size of the looming solar cycle 24. If it would be a large cycle, atmosphere would expand and the Hubble Space Telescope would fall out of the sky.. NASA was mandated to make sure that the satellite woud not cause damage or loss of life when it came down. To send up a spacecraft to refuel Hubble so it could make a controlled descent into the middle of the ocean would cost several hundred million dollars. Luckily, NASA believed our forecast of SC24 to be the smallest cycle in a hundred years and decided to leave Hubble in orbit, with resulting in an enormous saving of money and more than a decade [and still conttinuing] of wonderful science. Such is the value of acting on a good actual prediction, regardless of your disdain. Kip I did not and it is not relevant and besides I strongly fairly certainly I would truly understand what he talking about and more than he would if I explanted to him what was wrong with his computer after I fixed it and I am not talking about replacing a FRU but the actual failing component. It is his use of the English language that I have problems with. If he had said it is our prediction that cycle 25 will be going up and at this time the supporting evidence supports that, I would have no problem with that. Even with that his prediction and his study of the subject does add weight to the prediction but at this point and time it is only that and to state flat out that cycle 25 is going to larger than 24 is only a guess it and educated guess with year of work behind it yet it is still a guess, when we are more than half way through and his guess proves out good, he may be on something, but the next cycle and where it is going is only going to be a guess. If he has figured really figure solar cycle the only people that are going to know is my grand children’s children and even that it may be wrong. That is science claiming precession and accuracy in prediction of the sun cycles and were it is going to take far more than three cycles. Not only do I have a computer background I also work that computer back ground in the financial markets and in the most regulated industry in this nation(banking) proper wording and disclaimers is a fact of life, I wish science would have to be as careful. Maybe a number of thing I pay for would be 20 to 40 percent less, like electricity! Mark ==> You really won’t know what he’s saying until you read it, will you? That is science claiming precession and accuracy in prediction of the sun cycles and were it is going to take far more than three cycles. First off: it is four cycles. Now, you would be correct if we base the prediction on an observed correltaion without wknowing jow the cycle works, i.e. the physics behind the cycle. However, after decades of work we think we have a pretty good understanding of how the cycle works, what drives it [observed plasma movements], what feeds it [observed magnetic fields], and how it shows itself on other stars. Once the polar magnetic fields on the sun has reached a stable configuration, we can calculate how the next cycle will evolve [and we have done that four times successfully now]. As our measurements of what druves the cycle become better over time, so will the predictions. 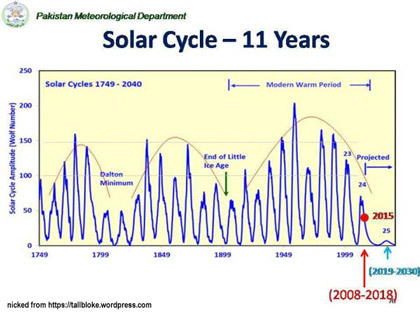 In a very real sense, the solar cycle is a much simpler system that the Earth’s climate. Complicated things can only exist in cold environments. If you heat stuff up enough and it turns into a gas all structure disappears and the gas state becomes really simple. The analogy with financial markets is false, because the market does not evolve from physical [or even psychological] laws and by its very definition must be unpredictable. Think of what would happend if everybody knew what tomorrows stock prices would be and reacted accordingly. Kip I was comment on his comment not his paper, again two different things, had Lief footnoted the paper in his original comment I would not have a leg to stand on. As the comment is firmly based on and derived from the paper, these are not two different things. Dr. Lief Svalgaard ==> Just to be clear — I’m using a nicked graph from someone else’s blog for convenience … not making any predictions about future Solar Cycles — other than we may be in a state of “reduced energy from the sun”. One of the papers mentions a possible Grand Minimum….which many have and/or do consider possible (but not you — clearly). There is a certain streak of wishful thinking among the many: in their zeal to combat AGW they wish temperatures to drop and so are biased towards a ‘weaker’ sun [which they cliam is ‘possible’]. Forgetting that any possible reduction of solar output is so small that its effect will be of the order of a tenth of a degree, and that that is no good evidence that a Grand Minimum is looming. It seems to me that you are feeding that streak. The two papers discussed in the brief essay above are from the journal Science and an article published at Phys.org. Are saying that either of these science news outlets are zealous to combat AGW? There is a lot a bad science out there and it is being used to the hilt. Dr. Svalgaard has been pretty spot on. My look at the SC25 says it may be a bit over – or a bit under – SC24. Leaning toward a bit over (but not much over), after reading various things put up by the Dr.
That graph should not have been used, in my honest opinion. I’ve seen others from serious people that are projecting a Grand Minimum. The projected peak for SC25 in this one is just plain ridiculous. Dent in head ridiculous. Writing Observer ==> Had I been writing about Solar Cycle predictions, I would have picked a graph that I thought contained either an accurate prediction or at least represented someone’s prediction. As it is, since Tallbloke’s post on one of the stories was already linked, I used his image as an illustration of the possibility of “reduced solar energy”. Actually, when the various solar and orbital cycles are simply overlaid in a computer screen and the resulting interference is observed, you end up with Maunder and Dalton Minimum regions. The interference pattern also matches up quite well with the historical sunspot record. This indicates that we are looking at least at a Dalton Minimum 2.0 or possibly another Maunder Minimum. Note, this is not a model, just simply the overlaying of known solar and orbital cycles. Anyhow, the small solar cycle 25 in the figure is realistic and possibly even exaggerated a bit—there might be no sunspots, as it has happened before. Just lining up cycles is not doing science, so I would rather go with the prediction based on the observed polar fields as input to actual computation of the resulting cycle [not a ‘model’ mind you, but integration of the equations]. higley7 ==> Svalgaard’s prediction is based on the Sun and very detailed data of its internal physics as seen from Earth. Find the link above somewhere to his PowerPoint presentation. I don;t know if he’s right or not, but his work is a bit deeper that a casual comparison of graphs — which isn’t a wrong thing — but probably not a basis for detailed, accurate prediction. It’s reasonable to expect that a sunspot minimum will have a big effect on stratospheric ozone. This is what I don’t understand about the whole hair-on-fire attitude people have regarding ozone. If UV doesn’t react with O2 in the upper atmosphere to create ozone, it will in the lower. In the lower atmosphere it breaks down more quickly, but O2 has done its job by then and blocked that UV photon from directly smacking one of my basal cell chromosomes. D. J. Hawkins: Did you mean melanin cells or do you have non melignant skin cancer? Meant to post this under D. J. Hawkins’s post the first time! The basal cells are the cells of the innermost skin layer and are where skin cancer usually originates. The ozone fiasco seems to be more complicated than the AGW fiasco. I am now well on the way to thinking that The Ozone scare is the 3rd greatest scam on mankind. I was waiting for someone to write that. Ozone is affected by UV… and the correlation may, should, could be related! D. J. Hawkins: Did you mean melanin cells or do you have non melignant skin cancer? Pakistan Meteorological Department? Give me a break. Tallbloke is getting really exotic figures. Is that Taliban propaganda? Lubin’s article on stars similar to the Sun UV emissions is not solid. The sample is too small. There are 25 Solar Grand Minima in the Holocene cosmogenic record. On average one every 500 years although they are irregularly distributed. A Sun-like star should expend ~ 16% of its time in a SGM. A sample of only 32 stars for 2 or 3 decades might not get any, even if the assumptions are correct. A regular solar cycle sees a 3-4% Ozone reduction at its minimum. A small decrease in ozone might be due to reduced solar activity. Figure A: variation in ozone with the solar cycle. As O2 seems to be in great abundance relative to any O3 level, the variation cannot be a direct effect 1 to 1 effect of any input. A) We have just enough input to make O3. B) Something is constraining the O3 concentration. If B then nothing matters except that constraining factor. No model works on that viewpoint. Except the idea that halogenated hydrocarbons are destroying O3 – and has done since photosynthesis evolved. Improbable. If A then we have always been on the edge of losing the Ozone Layer and we would never have evolved to survive the incoming radiation variations. There would never have been the chance for life on Earth to survive until now. Thus I conclude that the Ozone Layer variation is largely unimportant. QED. Solar cycle 24’s EUV (Extreme UV) and FUV (Far UV) emissions are running at about 60% of cycle 23, which, in turn, was down on cycle 22. So current EUV and FUV emissions are down significantly this century. However UVA UVB and UVC emissions in cycle 24 and cycle 23 are only slightly down on Cycle 22. Probably only about 10%. This makes sense as EUV and FUV emissions occur mainly from active sunspots and sunspot activity is well down. Ozone is also destroyed by photons with a wavelength less than 320 nm, so much of the UVA range and all of the UVB range of photons can destroy ozone. The O3 molecule that is hit by these photons splits into O2 + O, the subsequent combining of two oxygen ions then form another O2 molecule. Heat is produced by these reactions and this is the other main reason why the stratosphere warms with height and the mesosphere cools with height. The ozone layer is densest at approximately the intersection of these two layers. So less Ozone is being created by the sun in its current grand minimum state than is being destroyed. As a result the stratosphere and mesosphere have cooled and may cool further. This affects the jet streams and causes them to become more meridional. These more meandering jet streams can draw heat from the tropics more closer to the poles and cool air from the poles more closer to the tropics. The psuedo-scientists who advocate the world is doomed from global warming currently sensationalise the warmer weather close to the poles and overlook the colder weather closer to the equator. However the bigger picture is quite different and no different to other grand minimums, which also featured heat waves where normally they would not occur as well as cold waves such as have been experienced this winter over much of the northern hemisphere. IF solar cycle 25 continues this progression then the little ice-age conditions being experienced will only become more extreme. By mid-century it could be very interesting as there will have been enough volcanic activity to cool Earth quite conclusively. It does not seem to be the case. SC25 is now predicted to be a bit stronger than SC24. Predictions are always interesting. Seeing what actually happens is even more interesting. More than interesting. Useful ! “past performance is no guarantee of future results”. It is, if the performance is based on understanding of the physics. Dr. Svalgaard, Here you and I are in 100% agreement. In my work electronic repair I always take a problem starts some basic test and then formulate a guess what is wrong, further testing either confirms my guess or cause me to formulate another other, I do not shotgun a problems. Also since to the most part I work an a large amount of consumer equipment and later a large number of different computer starting with Mini and mainframes I more often than not had to start on very dissimilar problems some had a common root, most did not. You have done the same you now have a concept that from observing certain output previous cycle you can predict what the next cycle is. Correctly me if I am wrong, I only did a quick read and since my science background is limited and over forty years old, I do sincerely hope you are right. I also do not take my question you statement personal, over the years I been burned to often by experts and now I don’t take much stock in experts, in my previous job if I had listen to the experts the bank I work for and early on was responsible for security it would have been hack many times over. Again I only had problem with you wording, neither the prediction or your expertise. At the less than eight grade comprehension our media has and their blatant dishonest all must be careful on what and how we say something. Even at that they may twist you words to something they were not. Also having a computer background I have no faith in a computer being able to predict a chaotic system, even though so call experts tell me they can. For the past forty years I read and been told that and I know for a fact it not possible. It not possible even if one knew all the variable from the beginning and we had the computer power to run it before it all occurred. From reading you PDF you are not doing you are looking a very limited number variables and applying them to you model and so far you model is correct. That the way it should work and good luck with that all though luck has little to do with it, since it mostly work good work! A C-8.1 among 19 other flares? AR2699 seems ignorant of predictions. The Mg II core/wing ratio is a measure of the UV portion of the solar spectrum. It is used to estimate satellite orbital decay rates, which vary depending on heating of the ozone layer which expands and causes drag on the satellites and hastens orbital decay. And, I imagine, relates directly to the amount of ozone present. Seems to indicate that lower c/w ratios leads to lower ozone production. Doubtful if “short-lived chemicals” have much to do with it. The effect of UV on the ozone layer is well researched. Or, the Brewer-Dobson circulation is taking ozone to the poles faster than it is migrating from the upper troposphere to the lower stratosphere over the tropics right now. The upper stratosphere is where UV variation would be most likely to influence production. High solar activity appears to decrease ozone above 45km and increase it below 45km. Low solar activity does the opposite so the current low solar activity may well be the cause of BOTH the recovery of the ozone holes over the poles AND a decline in ozone below 45km in other latitudes. And how much have we spent worldwide trying to avoid the ozone non problem? We humans seem to like throwing money down a black hole. Do you know that a poster on this site from Argentina said you can openly buy CFCs for your air conditioner. Seems to be business as usual in Argentina. We should kick out the ploiticians that support the ozone scam as well. Wait Oh i forgot they are the same politicians that support the AGW scam. and these current reports appear to provide further support especially given increased Jetstream meridionality in recent years. I made this same argument (declining UV output during the ozone study period) on the original WUWT thread on the lower stratosphere Ozone thinning paper. Leaps from informative stuff about some interesting research into… frankly inanity. Why not just trying sharing your discoveries impartially – like a scientist or at least a well-informed lay person would? Oh I know, no sense of humour…sorry, but inanity needs to be pointed out despite your comedic talents. You then go on and your opinion seems to be that adding 2 and 2 gets 5, according Leif. I am not a Climate Scientist (and would not want to be one, frankly). I am a Science Essayist — I write to inform, educate, and sometimes, to amuse. What I write never pleases everyone — if it did, I would quit writing, knowing that I am failing at my task. A noble aim, it’s just that on this occasion you have failed on all three. If your aim was to muddy the water by feeding a streak of wishful thinking then you’ve succeeded admirably. Kip, my critique of this piece is not a personal attack. I am agreeing with Svalgaard. It is neither informative nor educative. Man up. I completely reject the “back into” also. Mmm. Kip I apologise for the tone of my criticism. Just spotted the ‘rebuttal pyrimid’ over on Willis’ post and my response while not at the bottom it was unnecessarily low. Mmm. My apologies Kip, the tone of my criticism was unnecessarily blunt and sarcastic. Just spotted the ‘disagreement pyramid’ in Willis’ post and while my criticism was not at the bottom, it was a long way from the top. zazove, tony mcleod, rudi ==> I am confused as to who is speaking in these comments — are all three of these names — ==> I am confused as to who is speaking in these comments — are all — the same person/same commenter? I would be much happier if people just used their real names — very few have reasons to hide their identity — this isn’t exactly the Dark Web, is it? The other name was being hounded by a particular poster. Rudi, zazove, tony ==> Well, alright — you all three apologize. I really suggest that you simply use your real name, or some unique version of it, human readable as we say in programmer talk, and don’t worry about the trolls and angry ‘tween-aged bullies. Just ignore them — here you can call upon the moderators to handle them if they get out of hand by starting your comment with the word MODERATOR. Rudi will endeavour to climb up that pyramid https://wattsupwiththat.com/2018/02/06/ideal-gases/ as we all should. zazove ==> Go Rudi! See if you can get zazove and tony mcleod to go with you. Pull on your crampons on Kip you’re coming too. Well stated: You are a gentleman Kip. I appreciate your candor here. – Photodissociation of O2 to form O3 is due to the incident high-levels of UV arriving from the sun into the statosphere. This UV absorption by the created O3 is greatest at the shorter wavelengths, UVC and UVB. – Any secular decline (over the period of study) in arriving UV would decrease O3 production, and unless this decline is taken into consideration, other conclusions about O3 decline are worthless. -. The solar F10.7 radio flux is an accurate proxy for solar EUV flux and thus to UV in general arriving at the TOA. The period of the Ozone thinning in the lower Troposphere study is from 1998 – 2016. A secular decline in UV output from the sun occurred during this period. But this is also a period when upper stratosphere ozone was apparently increasing while continuing to decline in the lower stratosphere. Maybe the Montreal protocol was working, but production of O3 the deeper (lower) you go into the stratosphere requires more UV flux than the higher levels were the atmosphere is much thinner. At any rate, UV was declining during this period, and the author’s make no mention of that. Nor is there any mention anywhere that I see here of the Dupont scientist that came out 20 years after CFCs were banned (and replaced with a newly patented refrigerant by Dupont) and admitted to having fabricated his work. We know now that solar UV and N2 in the atmosphere at low Antarctic temperatures break down ozone. It has noting demonstrable to do with CFCs. Banning the out of patent Dupont CFCs was a corporate profit scam, as the replacement was theirs and more expensive as well. Is mesleading as what is meant is in comparison with high cycles [such as 19] and not compared to SC24. The North Pole has now stabillized and the verdict is SC25 a bit higher than 24. The present time is a critical one for prediction. Now that both poles have aquired stable fields, we can finally have some confidence in a prediction. That was not the case a year ago, so any references to predictions a year ago are moot. Previsions are easier after the fact. [The mods prefer previsions be thought of ahead of the their appearance, and corrected before sending the reply. Thanks Lief for adding the necessary clarity to your prediction! Every prediction has uncertainty so there are always caveats, but the important issue is wheter the prediction is deemed ‘actionable’. That is: its uncertainty is small enough that one dares take action on it. If I predicr a 10% chance of a big earthquake where I live [California], nobody is going to do anything about it. If the prediction is a 90% chance and has often been spot on, it is time to take action. Kip you Lief quote is the kind of quote I have no problem with it has the necessary caveats, it is what I would expect for a learned man. His quote I complained about was short version of the above and since it did not have the caveats, what I take issues with. I don’t know what the ‘sunspot anomaly’ is. But, SC24 was just like SC14 and SC25 looks like it will like SC15, so we seem to be replaying the Gleisberg Minimum around 1910 but not the Dalton Minimum [which in any way is poorly observed so we are not sure what the values were]. 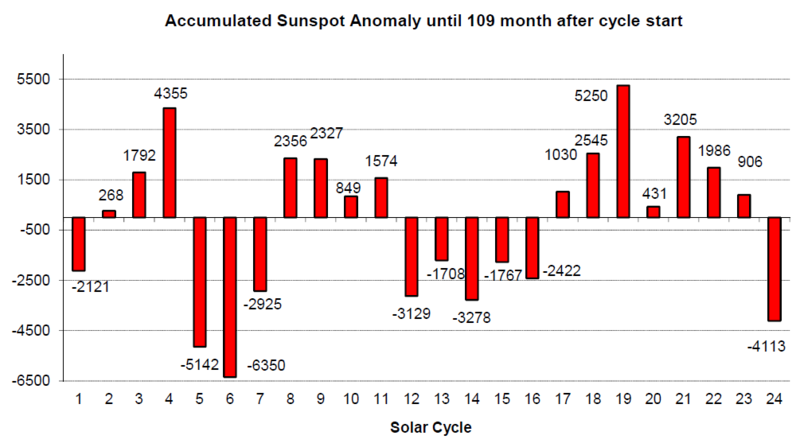 Leif, the sunspot anomaly is the difference between the monthly averages of SC1…23 and the actual monthly value of the single cycle. When one accumulates these anomalies up to the actual month one gets the data from the figure. It’s slightly different from the max. of the cycle because it also reflects the time behaviour over the whole lenght of the cycles. Insofar the SC24 was a little bit weaker than SC 14. In Solar Science we do not operate with your ‘anomaly’. The main reason is that there is debate and uncertainty about the long-term behavior of the values, so the quarter milleneum ‘mean’ may not mean much in real physical terms. Also, the whole idea presumes that the Sun has a long-term memonry, i.e. that cycles now can meaningfully be compared to cycles way past. Rather, each cycle is an event on its own, albeit connected to the polar fields left over from the previous cycle. But there is nothing left of the activity several more cycles in the past. There is no ‘storage area’ deep in the sun containing the skeletons of past cycles. The convection zone overturns in a matter of a months. Leif, it was not said that the sun has something like a “long time memory”. The index only shows the relative strenght of the cycles in comparison. I found it better to look also at the variation over the time and to calculate an integral and not only looking at the max. 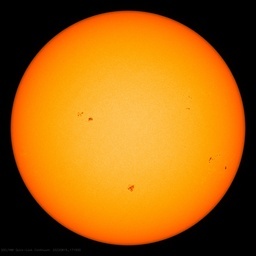 The uncertainty of the latest monthly sunspot record is of course included. Anyway, I’m glad that I was able to state how this index works, if it makes any sense in science is another question. Under the [dubious] assumption that the calibration of the sunspot number has been constant over centuries. That assumption is almost certainly false. So what is the comparison worth? Perhaps it shows more about the calibration than about the sun. I instigated all those workshops and may be presumed to speak for them. The average is never a good thing to follow. Consensus is not science. The resulting series are perhaps the best we can do at the moment although there are disagreements between workers of 50% or more. So detailed numerical comparisons are fraught with difficulties and show meore about the calibrations than about the Sun. PS: If the monthly record is biased in a serious way: how can you make comparisons about the maximums? You said: “But, SC24 was just like SC14 ” and this is also not justified due to the unstable calibration?? I would think that some unstable calibration is more canceled out by the integral over the lenght of the whole sunspot cycle following that the accumulated sunspot anomaly is more stable than the comparison of the max’s. The calibration gets better after about 1880 and especially during the 20th century. But is particularly bad areound the Dalton minimum. No, that just amplifies the uncertainty by accumulating it. There are still people who cling to the old Hoyt&Schatten reconstruction which differs up to 50% from ours. “There are still people who cling to the old Hoyt&Schatten reconstruction which differs up to 50% from ours.” Not my numbers , I used the latest from here: http://www.sidc.be/silso/ . These are your’s AFAIK. If you used the Sunspot number they are by SILSO [not by me]. My reconstruction is of the Group Number. However, the two series differ only by an almost constant factor [about 20], so should be equally good for long-term studies, because the uncertainty is greater then the difference. I work in water treatment. We use Ozone. The have a system to destroy the O3 that has off gassed from the water. Al’s original scare was the Ozone “hole”. (Fail) Next came CO2 making the Earth’s core 1,000,000 degrees….er…sorry…hard to keep the nonsense straight sometimes. Neither scare works anymore so they’re recycling Ozone? And costing us all a hell of a lot of money. The Chinese and the Argentinians are laughing at us. I wonder how many other countries are openly using CFCs. I seem to remember Hathaway]s prediction was that 24 was going to be larger than 23. Doesn’t give me confidence in any prediction either way. It does lead to an interesting point. If temps are going to plateau during 25 (assuming the AGW theory and this one are correct) then the actual temps should have been higher than average during the larger solar maximums, which implies that the climate models accuracies are even worse than they appear, right? climate models accuracies are even worse than they appear, right? in climate science everything is worse than expected. even those things that are better. more snow, less snow. hotter, colder. more ozone, less ozone. makes no difference. everything, and its opposite, is always worse than expected. that is what separates climate. science from lesser disciplines. no matter what climate always turns out to be worse than expected. this makes climate models inherently predictable. ferd ==> You mean we can predict that “it will be worse than expected”? Quite right, ferdberple. If it was not ‘worse than expected’, they would not even mention it. However as it is always ‘worse than expected’ they can start an immediate search for a new scapegoat to generate Grants with. Willis informed us that the only thing the climate models get right is backward predictions on previous temperatures because once they know the temperature they finetune the models to produce that exact temperature. This is like the golf swing analysts on TV. After they know the result of the shot they then analyze the swing of the PGA golfer. Of course that makes their analysis 100% correct. I wonder if support for AGW is dropping in Finland. As with religion it will probably take a long time for warmists to face up to the truth. They may never. That is the scary part. If there’s another pause the computer models didn’t predict well you read it here first and it’s all very predictable. Perhaps it also has something to do with the strong Ferrel Cells pushing cold air around the northern hemisphere. The first clues were the hurricanes and the weird way they were forming in cold waters, stalling out over Texas with a cold falling air right near. The Ferrel Cells pushing cold dense air into the American interior causing Santa Ana winds and wild fires from the adiabatic warming of the dense dry air. Cooling in the upper atmosphere, perhaps this will continue cooling the planet, not sure if we know enough but it may continue. Here is a key component of cooling, imo. The sea ice around Antarctica is below average once again, but as a result of that cooling surface temps have expanded northward. The effects can readily be seen, Notice how the west coast of South America is cool in the middle of their summer as surface winds carry the spreading cold from Antarctica northward. The tip of SA is currently experiencing freezes. The cooler air can be seen grazing the southern extremities of Australia, the east coast of Australia, Tasmania, and New Zealand. Taking a step back: Susan Solomon’s work on ozone in the atmosphere will probably be remembered as a great discovery: at the least, the release of specific compounds into the atmosphere could have specific effects on both ozone holes and amount of ozone, and these in turn could affect temperature, or otherwise affect life on earth. The specifics? CFCs–man-made, of course–were supposed to be the big danger, so now there is a treaty. Maybe this has addressed ozone holes (maybe not? 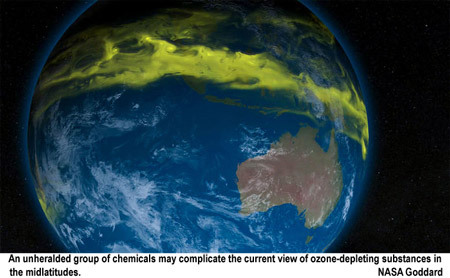 ), but there is still this pesky problem of the amount of ozone. Let’s point at other compounds that might “cause” ozone-related issues. If they’re man-made, maybe we need a new treaty, and the basic Solomon narrative will hold up. But if some compounds released by organisms naturally can cause ozone-related issues, then we need a different narrative, not insisting that man-made something something is the biggest problem. The biggest concern with Solomon’s work and the CFC treaty is that it prepared the way for global climate man-made something something. “…the ozone layer in the lower stratosphere is growing more tenuous…” By how much? Is the current level sufficient to provide protection to the biosphere? Is the situation comparable to going from sea level to a ski resort, or significantly less? If UVC gets through the stratosphere, then what? Almost certainly more ozone will be created in the upper troposphere. Yes, its half-life will be less than in the stratosphere, but as the LA smog basin clearly demonstrates, tropospheric ozone can have a substantial persistence. While ground-level ozone has undesirable effects, that is an entirely different story than the concern about cancer and cataracts. The central issue of the decline in stratospheric ozone is the POTENTIAL (could, might, possibly, etc.) increase in surface UV. Where are the measurements of the increase in the absolute values of the UV flux? If there is some compensating mechanism, such tropospheric absorption of UV, then the whole hypothesis is invalidated. It becomes a tempest in a tea cup. That isn’t to say that there might not be other undesirable results, but it would eliminate the concern about melanoma and cataracts. Clyde ==> Is there no agency that actually measures and tracks ground-level UV at various sites? I haven’t spent much time on this recently, so I may be wrong. However, to the best of my knowledge, there is no one doing continuous measurements. As I understand it, one of the problems with measurement of absolute fluxes is that the UV degrades filters and changes their opacity rather quickly over time. Thus, it is difficult to keep them in calibration. A number of years ago I built a model initially in BASIC, and then, later, using a spreadsheet. It relied primarily on TOMS ozone data and was fairly sophisticated, taking into account the Earth’s orbital eccentricity, sun elevation, and sun spot cycle. What it showed was a slight increase in surface UV over a period of years, in the Winter, when UV levels were low, but a ceiling on the Summer values when protection was most needed. That is, most organisms have adapted to the maximum Summer UV levels, and should have little difficulty dealing with the much lower Winter levels, even if they are increasing slightly. Several years back (after I built my model) there was a website by CIESIN that provided current and historical estimates of surface UV at major US cities based on a fairly sophisticated model that even took into account clouds. When I ran a few cities, I could not discern any trends to support the thesis of increasing UV. The website has since been retired. The local weather bureaus provide an estimate of the UV Index on a scale of about 0 to 14, which is supposed to correlate with the potential for biological activity. I suspect they are models and not actual measurements. They might be of some utility if any of the local weather bureaus have maintained an archive through the years. Clydde ==> Thanks, I’ll look around at CIESIN, I quickly found a 1998 assessment….but nothing ongoing and current popped up in a 5 minutes search. I’ll dig in when I get the the project — Thanks. Thanks for the link. It essentially confirms my understanding of the situation and seems unbiased. The only question I would have is if the modelers took into account the increased scattering and absorption occurring with low sun-angles, and consequent increased slant-range paths, and the difference between total-column ozone where the sun’s rays enter the stratosphere and where the surface measurements were being made. To do it properly, the absorption and scattering should be calculated by integrating along the path length as the air density and ozone concentration change with both elevation and latitude. One of my pet peeves is that the alarmists get excited about the “Ozone Hole” when the sun is never directly above the so-called “hole,” and the sun’s rays typically enter the stratosphere outside the depleted region, often encountering anomalously high ozone concentrations outside the circumpolar vortex. Clyde ==> I would settle for just a good dependable record of the mid-day UV readings over a period of years. I’m just trying to find out if the UV hitting the Earth has increased or decreased or remained more-or-less the same. There was some nonsense years ago (when I had a site called The Bad Science Times) when frogs deaths were being blamed on increased UV because of the “hole in the ozone layer” — in the US Northwest! Of course, no one actually measured the UV there, at all, ever…. Clyde ==> Yes, that’s the sstudy — they used a UV blocking plastic to shade some of the floating frog eggs, erc. What they never did was measure UV, before or after — there was not reason to believe UV had increased except for the “hole in the ozone layer – at the South Pole. 1) Recovery of the polar ozone hole would likely be largely due to solar factors and less to do with CFCs. 2) The thinning would also prove less dangerous to the biosphere because there would be possibly commensurate reduction in UV danger. Gary ==> I’m not a solar expert — and am not sure about the relationships between UV arriving at Earth (to[p of atmosphere), Solar Energy, strengths of the various UV types, how much what UV ozone (total column ozone, btw) protects us from, etc. Maybe another reader can comment on that. For the record. I predicted SC25 to be stronger than S24. In fact it will be similar to SC23. Has to do with the GB cycle. Similarly. You cannot look at recent data on ozone. Have to look at it over a period of 87 years. Recommend you look at the data from Arosa in Switzerland. Goes back to 1927 if I remember correctly. More ozone means less UV energy in the oceans. Less ozone means the oceans will get warmer. Has to do with the GB cycle. The existence of the 87 year Gleisberg cycle is evident in the results of many scientists, including myself, and many scientists looking at it before you. The ‘cycle’ is not stable enough or repeatable enough to be useful for precise prediction. E.g. what would your prediction for cycles 19 and 20 be if using your GB cycle? you claim no stability in the GB cycle? 12000 years is not enough for you? Remember I have said before that, really, your 11 year SC is bogus. Even the above report starts off by mentioning that the real SC is 22 years…. Regardless of your genius, this is what the last 300 years look like. There have been three ~105-year ‘cycles’. No sign of your 87-year GB. And you evaded my question about cycles 19 and 20. Answer it to gain[?] some credibility. and as discussed before, you have to look at 2SC’s that equal one Hale cycle. Take the average of each Hale cycle and you see the pattern. and note that I would never look at a subjective measure like SSN more than 100 years back…..
GB trend in ozone results. Anyway, Leif, if you want to help me, cannot you ask your daughter in CH to get me the monthly data from Arosa for the last couple of years? I cannot find it on line anymore. I would never look at a subjective measure like SSN more than 100 years back…..
And yet you were pushing 12,000 old data. Go figure. Arosa: the last couple of years don’t do much for the long-term trend. Perhaps we are all students and teachers to each other? when was that again when they did that research showing the persistence of the GB cycle over the past 12000 yrs? Better just check your words before you write them. Pity you canmot help me getting more Arosa results. No, sorry Henry, there is nothing to learn from you. And you still evade [for good reason, I surmise] to answer mey question about how your 87-yr ‘cycle’ predicted cycle 19 and cycle 20. 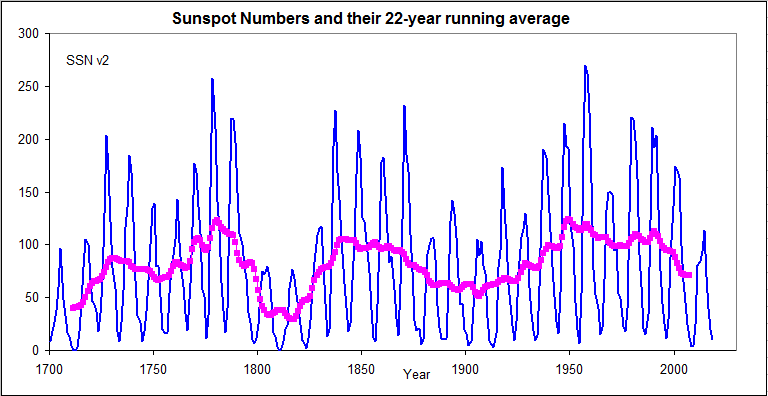 There is no 87-yr cycle visible in the sunspot record stretching back 400 years. If there has been a cycle, its period has been more lime 105 years. You can always learn from another person…pity you don’t get that. Anyway. To see the GB cycle you have to look at earth. Like many did before me. Looking at levels of lakes, rivers, ice, weather patterns, etc. Only when you established the cycle on earth, as I have proven that it does exist, you must start looking at the sun and suspect a correlation. FIRTST Go look what is coming through the atmosphere. Only if that other person knows what he is talking about. Anyway. To see the GB cycle you have to look at earth. 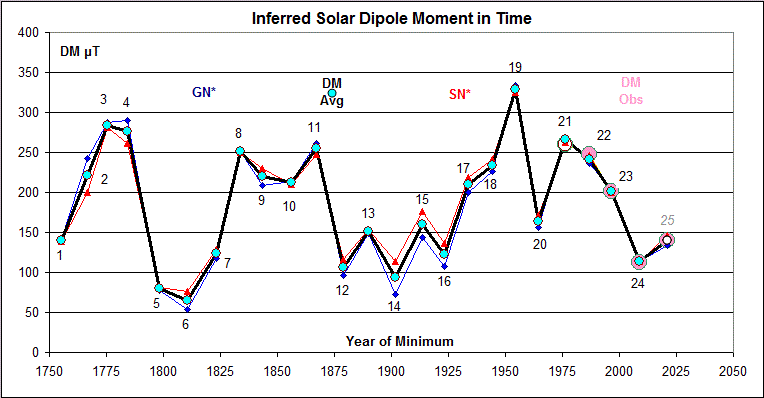 No, to see a solar 87-yr cycle, you have to look at the Sun. And as I showed you, there is no such cycle the last 300 years. You still evade my question: how do you predict cycle 19 and cycle 20 usng your GB-cycle? That I would like to learn. If you still evade to answer, I take it that you agree that your GB-cycle is useless for prediction. Go back and you will find that I have already answered the question. You want me to predict the next SC that has an anomolous SSN? No, you have not. What were the predeicted values? for SC19? and for SC20? Your evasion shows why one does not learn much from you. Dr. Svalgaard, Thank you very much for the efforts (and patience you show) you offer to us here on WUWT. I don’t understand much of what I read, but I keep picking at it and sometimes understanding follows. Thank you again, good sir! It is my goal to be informative. And if you have questions, I’m ready to answer them [to the best of my ability based on what knowledge we have wrested from Mother Naure]. Thank you to all who read and commented here. As usual here at WUWT, the comment section went off in its own chosen direction and concentrated on Solar Cycle prediction, led by Dr. Leif Svagaard of Stanford Universtity. after getting off to a rough start the conversation settled down and some aspects of solar Cycle Prediction [Svalgaard style] were explained…some even understood as a result. Of course, this essay wasn’t about that, but that’s how it goes here. For those who never did get it, this essay was about simultaneous announcements that 1) the total column ozone was thinning in the mid-latitudes — “for reasons that scientists are struggling to fathom.” and 2) solar scientists postulated that reduced solar energy “from the sun sets into motion a sequence of events on Earth beginning with a thinning of the stratospheric ozone layer.” Neither paper mentions the possibilities of the other. The scare about the O3 decline in the lower stratosphere hides the most important statement found in the Ball et al. paper, i.e. the TOC (total ozone column) remained more or less constant. As an supposedly dangerous increase of UVB radiation is suggested as the consequence of O3 thinning, it is refreshing to note that here in Luxembourg there is ***NO*** increase in erythemal UVB (also called UVE): look here). These measurements are confirmed by UCCLE in Belgium, which have one of the longest TOC series in the world. See their TOC trends here. So: TOC remains constant (for ever reason), UVE remains constant –> there is NO problem! fmassen ==> Thank you for the UV data from Lux — and the link to the data. Asked another reader to find a source for UV-at-the-ground data but not seen any other yet. Here in the SH, the effective power of UV has lowered in recent years. With rare excursions from flare-ups. If the next SC is similar to this one as LS says, then we can expect more cooling. Brett ==> I take is SH means Southern Hemisphere. Can you give us a link to the data source. I am trying to find a reliable long-term measurement of ground-level UV at various spots around the world. Those ozone changes combine to alter the gradient of tropopause height between equator and poles. Any significant reduction in solar energy reaching the surface is due to more clouds from wavier jets (and not cosmic rays as per Svensmark). there are not many people who figured out that global T / & weather is driven by the amount of energy reaching the oceans which depends on the amount of UV going into the oceans. I was astonished. Starting off my investigations, being made to believe that a trace gas like CO2 could ‘trap’ energy and make earth warmer, I now believe that a few trace gasses that are manufactured TOA by the most energetic particles coming from the sun can play a much bigger part by deflecting energy away from earth…. Yuo are still evading to answer my question. It is not my problem if you don’t get it. looking at the solar magnetic field strengths, you can see that the top of the GB sine was in 1971 and the bottom was in 2014, as also confirmed by several of my own measurements. So the next solar cycle with anomalous SSN will be in 2037/38. If you want to communicate, you do that by answering here and now. You were supposed to just give TWO numbers: your predicted Rmax for SC19 and SC20. And if you want to gain some credibility you can explain how you got those precise numbers. Take the average of each Hale cycle and you see the pattern. And what are the two numbers you predict for SC19 and SC20? I don’t think you did that right. Is that a moving average of 22 years? Whichever way you look at it, something odd did occur around 1971. This is what you call a SSN result for a SC that nobody would expect. Seemingly anomalous. But clearly, to me, there was a turning point. If you look at the magnetic field strengths it looks like a (single) solar cycle within a (single) solar cycle. I cannot do this with the wft program, but imagine that the red line is part of a half hyperbole moving up. The blue line is part of another half hyperbole moving down under. That means that around 1971 there was a dead end stop. There is no other way. There was an electrical switch in 1971 on the sun. [IMHO most probably caused by an additional gravitational pull from the planets. There are some before me who have postulated similar conclusions.]. In 2013-14 there was another dead end stop. The next dead end stop will be 43 years from 2014 (i.e. one half GB cycle ahead), i.e. 2037. 2014 + 43 = 2057. We won’t be around to see it happening. HenryP and lsvalgaard ==> I don’t think you are going to resolve your differences here on this thread — unless something gives in one or the other of your viewpoints. May I suggest a dual author post? You each write an explanation of your viewpoint in a thousand words or so, without reference to the view of the other. 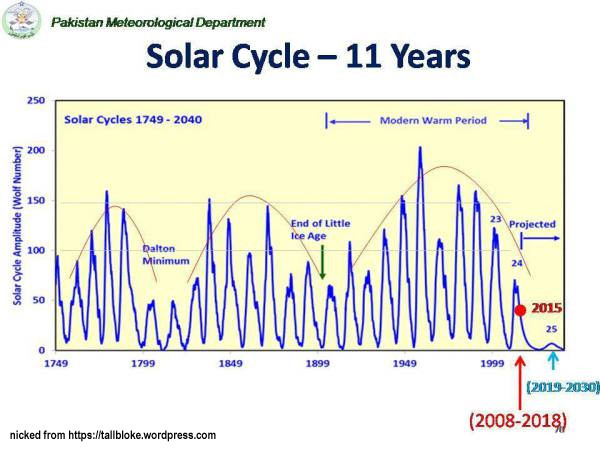 Just your view on what you are going on about, which is, I believe (if I understand correctly), what long-term Solar Cycles exist and which can be used to forecast future Solar Cycles. If you each agree — then send your separate essays to me and I’ll try to put them together in a reasonable presentation for the readers here. From the response of the readers here in comments, it should be a welcome essay. If you both decide to try it, send your essays to me at my first name at the domain i4 decimal net. I don’t have a problem with your proposal although it might be a bit of a challenge to say some useful on the GB cycle with only 1000 words available…. I doubt Leif will accept. Henry ==> Guess we’ll have to see. Admire your work for those in need … my wife and I did 11 years in the Northern Caribbean doing humanitarian work until we ‘retired’ two years ago. I have described that in detail so many times, that it hardly seems worth the effort to repeat yet again. To summarize(in 35 words or so): there has been a quasi-cycle of 105 years the past 300+ years, and no 87-yr cycle. It is therefore not useful to base a solar cycle prediction on a non-existent 87-yr cycle. thanks for that comment. I also appreciate very much what you have done to help those in need. Here is my latest newsletter: my wife is also ‘retiring’ now. I think she will help us to get a lot more things done…there is something about women that always make them succeed more in raising funds than men? Henry ==> IMHO, women really honestly care abut others on a very personal basis — it is part of their eternal nature — this attribute communicates to others naturally and invites others to help.